Will bring you official wedding photos later. 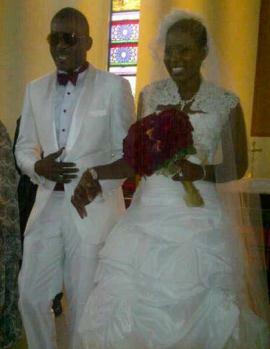 Happy married life to Chidi and Jean Mokeme. I would have gone into a shock induced coma if Chidi didn't wear a white suit. Wat is it Ω̴̩̩̩̥ grooms wit white dese days? She is based in America... Mmm.... I smell a green card here!!! awwwww.....beautiful couple. God bless their union. Thank God for Chidi...finally finally! Happy Married Life! i wish u a happy wedded life,gr8t properities and lots of babies. BTW i hope this wont stop u 4rm appearing on our screens. Chidi you won knack the woman that staff u're holding..u guys luk good..
i and my brothers wish u a happy mariage and we hope 2 kip seeing ur face on d whole of nigerias screen. Not worthy of a comment!!!! Remember if you are inspired to have her hair cut, you have to have a nicely shaped head and a full head of hair. lol. I have neither of those by the way! Beautiful elegant bride, bless you both plenty. Wishing you guys,happily ever after!!!!!!! Wow, this is the first Nigerian Bride im seeing with a low hair and she still looks stunning... Lucky Chidi. Chidi laughs and smiles in such a horrible way. And his dentition is nothing to write home about. His teeth are better hidden than seen. Jusy saying. That sule that said I small a green card? Its blue passport they use in America dumb head. U think its everybody tha'll be greedy like u? Or can't people marry from any part of the world irrespective of their status? Olodo oshie...Hapi married life beautiful couple. Dear future hubby,If u insist on wearin a white suit to our weddin,get ready to c me in a red/orange weddin.All eyes must b on me nt U. Comrades, is the irony lost on us as Afrikan people when we call the European marriage procedure the "white wedding"? Where in Europe are Europeans using Afrikan marriage rituals or processes to tie the proverbial knot? Colonialism did a number on us. When are we going to stop using European personals as our personal names? We need to emancipate ourselves from mental slavery! Pls who knows how dey stuck that hat on her head? An American citizen is entitled to a blue passport but before if you move 2d USA by right of marriage or employment,you get a. Resident permit i.e Green card which allows u entry n exit in2 d US without a visa pending d time you're eligible to get an American passport. ¶ D̶̲̥̅̊ε̲̣̣̣̥γ̲̣̣̥ feel U̶̲̥̅̊ bro! ¶'ve been saying dis right from M̶̲̥̅γ̲̣̣̥ childhood that until ¶ see 'white' people doing a 'black wedding', it's only then ¶'ll consider their so-called white wedding. u just got me rotflmsao!! I second the motion ooo! Time for women to go back to their roots...time to give up the weave..naturals the way to go..